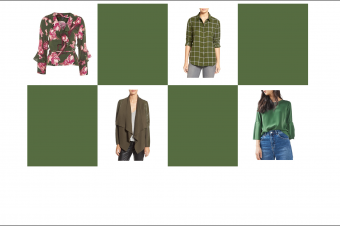 This is the sixth post in a 10 part series on how to wear the Pantone Seasonal Colors (Niagara). For posts on the other colors visit the Pantone Seasonal Color Page. Niagara is a dusty blue color – great as a base for some of the more vibrant colors for the season. The most obvious pieces to find Niagara are in chambray and denim pieces that will easily mix with brighter colors and neutrals. I have two suits in this color as it makes a great option that is not black! They are very versatile because they can be styled with so many different colors. I opted to accent one of my Niagara colored suits with a Flame colored cami (another one of the Pantone seasonal colors). A note about the Asos suit – I wear my regular size in the pants but I wish I would have sized up in the blazer for a more boyfriend like look. I also created a similar look with a Niagara colored cable knit sweater. While I wore this to the office – it could be more casual paired with denim or leggings for the weekend. Feeling a little more daring? I paired a chambray shirt with a boldly striped silk skirt from J.Crew that includes many of the seasonal colors (Primrose Yellow, Kale, Pink Yarrow, and Hazelnut). I would argue this skirt could go with almost anything in your closet. The trick is not to match – but compliment the bold stripes. This color is an easy one to find pieces in. I’ve pulled out a few work specific separates you could easily incorporate with basics you already own.